It may have been the most famous "happy hour" in modern American history. The U.S. president, a policeman and a professor had beers together this week, after an escalating incident that reminded America race still matters. The police officer is Sgt. James Crowley, a well-regarded white patrolman in the college town of Cambridge, Massachusetts. Was Obama right to become involved in dispute The professor is African-American scholar Henry Louis Gates of Harvard University, who is also one of Barack Obama’s friends. The tensions between them drew much of the country’s attention over the last two weeks, but they began simply enough: with a jammed front door at Gates’ home. Gates couldn’t get through it until he forced his way in and a neighbor who didn’t recognize him called the police to report a potential burglary. Officer Crowley arrived to investigate and things went badly. He realized Gates was no burglar but considered him uncooperative and arrested him for disorderly conduct. Exactly what happened between the two men isn’t clear. Gates says he was a victim of prejudice. Crowley said he was just doing his job with a difficult member of the public. But images of the startled and angry academic standing outside his home in handcuffs were quickly broadcast nationwide. And the president, who has tried to lead the country without particular reference to color, spoke out. It was a well-intentioned effort. But a few back-yard beers couldn’t be expected to end the two weeks of tension or even begin to remedy the country’s long legacy of racism. Even with a black man in the White House, skin is still a very sensitive subject. 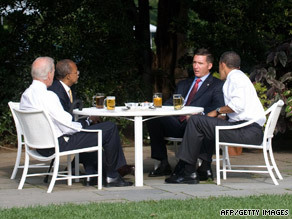 What Kind of Beer is Served at the White House?